Mimicking of the living matter mechanism of cooperation by complementarity represents one of the most challenging tasks of supramolecular chemistry. The momentary solution consists in using particularly designed molecular unimers, endowed with the necessary amount of chemical information. 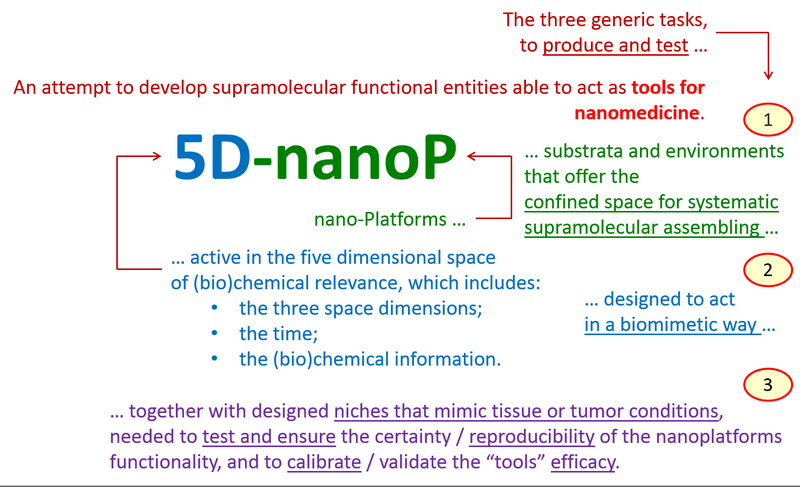 The 5D-nanoP project is dedicated to interfacing the fundamental research area of constitutional dynamic chemistry with the practical approaches of medicinal chemistry and biomedical applications. 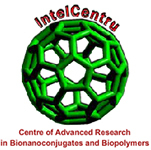 In the spirit of a metaphor of Jean-Marie Lehn (Nobel Prize in Chemistry, 1987), the project aims to materialize the concept of 5D chemistry in designing, synthesizing, characterizing, and using molecules with conditional affinity, to build versatile supramolecular nanoplatforms able to vectorize compounds of pharmaceutical or biochemical relevance, all of them involved in physiologic and pathologic processes at cell- and tissue-level. The project will add the layer of 5D chemistry over the backgrounds of molecular assembling line techniques, to produce particulate nanoplatforms, self-assemblable in the virtue of the chemical information stored by the designed unimer molecules. Two modern techniques of building dynamic chemical structures will be considered: (i) the use of self-immolative linkers, and (ii) the space stepwise and time phased assisted synthesis. In order to prove the applicability of the produced nanoplatforms, an ex vivo cell cultivation system will be developed, to emulate tissue/tumor niches. 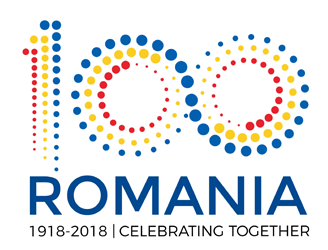 Seven teams will be involved in the 5D-nanoP project, to cover the main addressed research areas: (i) the in silico molecular design, (ii) the development of a unimers chemical library, (iii) the development of a molecular assembling line, (iv) the conjugation of the developed platforms with chemical species of biomedical interest, (v) the build of ex vivo emulating niches, and (vi) the bio-oriented assessment of the nanoconstructs efficacy.